The Bronx first appeared in 1956 and set the standard for British motorcycle jackets for the next 30 years. The design was based on D Lewis flying jackets from the 1920’s and updated for the Cafe Racer riding style popular in the mid 50’s. The expandable back allowed for a forward riding position, the leather coated buckle prevented scratches to petrol tanks and the styling was something that youthful British motorcyclists adopted as the ultimate ton up jacket. The Bronx is Britain’s most popular leather jacket. 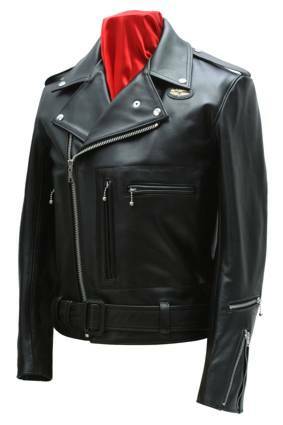 It’s a Lewis original, designed by an expert and pioneered by Lewis Leathers in England. Made of heavy quality black leather with a luxurious quilted scarlet lining and a double breasted front to keep you warm on the worst journeys. The Bronx has an adjustable built-in half belt with leather covered buckle to maintain a snug fit and plenty of pockets for all your odds and ends. Please note that larger sizes ara available but are subject to a surcharge of 30% for 46″ & 48″ and 40% for 50″ & 52″. Please email us using “Contact Us” option above for larger sizes.